Made: Illustration, Zine and Art Fair! The Tote Bag Book Feature! I finally got my mitts on a copy of the excellent Tote Bag Book, a resource of the weird, wonderful, quirky and beautiful artworks that have graced the humble tote bag, written by Jitesh Patel and published by Laurence King. I had my Wits and Dandies series included in the lineup of designer illustrated tote bags alongside the likes of Airside, Catalina Estrada, Jeremyville and eBoy (among many other talented artists) The best bit? unwrap the spine and you get a free tote bag designed by Gemma Correll-Yeses! 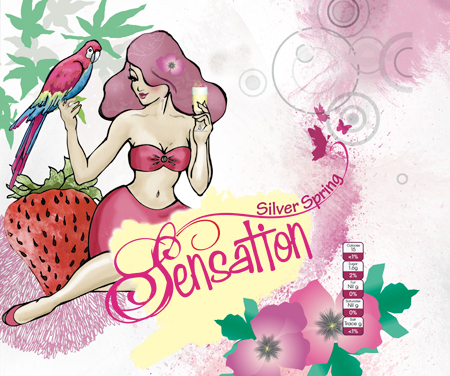 Here is the full wrap artwork for the ‘Sensation’ concept for the drinks company Silver Spring, the logo design and a mock up of the brand. It was great to work on a full wrap illustration as it gave plenty of space for the vintage inspired artwork and an opportunity to fill the space with colour. It was important to create a design that was eye catching, one that would appeal to the female market and stand out on a crowed supermarket shelf. It was a great project to work on, so cheers!